Walk into an upper-level college physics classroom almost anywhere in the country, and you’ll see students sitting down, listening to the professor and taking notes. Despite years of education research showing that students learn better by being active, the common curriculum for juniors and seniors in physics still emphasizes passivity. 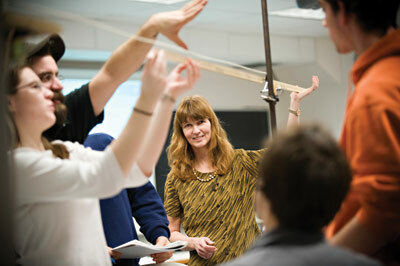 At Oregon State University, advanced physics instruction has already made the transition. Walk into an upper-level college physics classroom almost anywhere in the country, and you’ll see students sitting down, listening to the professor and taking notes. Despite years of education research showing that students learn better by being active, the common curriculum for juniors and seniors in physics still emphasizes passivity. In recent years, a revolution in teaching methods has replaced rote learning with active engagement in introductory classes. Upper-level instruction has remained resistant to change. At Oregon State University, advanced physics instruction has already made the transition. Ten years ago, Corinne Manogue and colleagues in the OSU Department of Physics overhauled their whole approach to teaching. They turned the focus from lecture to action, from professor to student, from rote learning to problem solving. They redesigned a classroom where students collaborate around tables and sketch and share ideas on small white boards. They concentrate on topics that are central to the understanding of subdisciplines (such as classical mechanics, optics or electromagnetism) normally treated in separate courses. They can shift from presentation to group discussion to lab in seconds. No lecture-style seating or time to rest for these physicists-to-be. “To my knowledge, OSU is the only university in the country to do this overhaul in the upper division,” says Manogue. Begun in 1997 as a modest effort to accommodate students enrolled in engineering physics internships, the OSU reform initiative has received more than $1 million in National Science Foundation support, including a 2007 grant to write two new textbooks, to create a detailed Web site and to adapt abstract mathematical tools to specific circumstances in physics. Since 1999, Manogue has presented the program, known as Paradigms in Physics, to educational conferences and to more than a dozen of the nation’s 760 degree-granting physics departments. Elements of the curriculum are being adapted at other universities such as Texas A&M and the University of Colorado. Paradigms strives to give students a rich understanding of the many approaches that physicists take to problem solving. Power, says Manogue, comes with mastery of the tools that physicists have developed in concert with mathematicians and software engineers. So the Paradigms courses — three-week intensive classes that meet daily — revolve around ten fundmental topics (oscillations, central forces, one-dimensional waves, and periodic potentials, for example) and the equations, graphs, computer visualizations and narratives that define those topics. In a typical junior-level class, Manogue poses a problem and asks students to discuss it, to define it in mathematical terms and to describe the solution in words. As students talk, she stops to listen at each table and asks leading questions, challenging students on their choices of words or equations. Whether dealing with the oscillations of a string, an electromagnetic charge in space or the forces that affect planets as they revolve around the sun, students are encouraged to think like physicists. In the senior year, students use many of the same tools to explore more advanced topics in subjects such as quantum me-chanics or electromagnetism. By building on what they learned in the previous year, they reinforce their knowledge and gain confidence. Manogue suspects that the changes in learning stem from the philosophy of active engagement, but pinpointing which methods are critical takes systematic assessment. In 2007, the department hired Assistant Professor Dedra Demaree to lead physics education research and bring these active engagement ideas to the large-enrollment introductory courses. And the department’s home in Weniger Hall is scheduled to receive an upgrade in its classroom facilities in the near future. In rooms now equipped with standard lecture-style seating, the department is working with Peter Saunders in OSU’s Center for Teaching and Learning and the Classroom Renovation Committee to incorporate designs that can accommodate more active learning approaches.